Yes it is officially springtime in California. The weather patterns are settling into the norm (sunny and warm – although the more intelligent residents are still hoping for some massive rainstorms or we will all be rather thirsty come September). Birds are singing and flowers are blooming as the northern hemisphere starts renewing itself and the sound of booted rugby balls and hard tackles is no longer confined to the west coast but is now echoed across the country. Granted, some of these sounds are still muffled by snow – we’re looking at you New England – but all in all the hope and promise of springtime has wound its way into our souls, reminding some of us that we have one. The biennial East Midlands exchange hinges on more than trans-Atlantic camaraderie and rugby games: the midpoint of the exchange consists of a visit to Yosemite Valley with our guests. Tuesday morning, March 18, found Eric Rauscher on the road with his two billets, Paul Senior and Chris Elliott, while I made a detour north from Salinas to pick up Andrew Beckett at Frank Merrill’s house in Atherton. Sometimes you wonder – I’ll be in the car half a day with someone I’ve never met. How will the time pass? 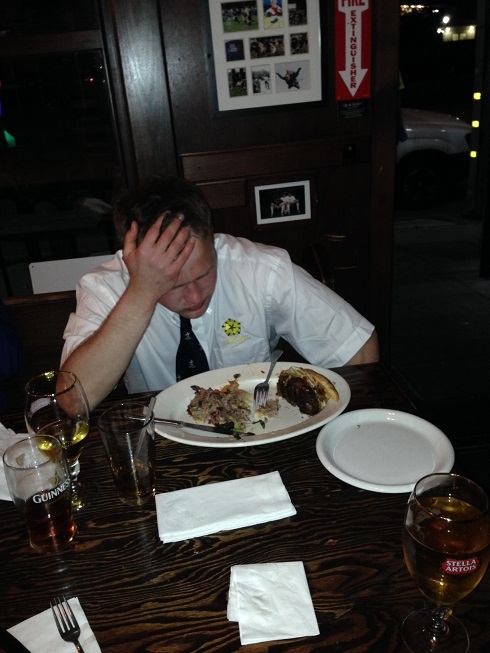 And then you find a world of common interests, rugby aside, and the miles fly by. Such are many rugby friendships. Rugby is often a shibboleth, an indicator of an interesting person who would make a good friend. Among other overlaps in our Venn diagrams, Andrew was in the Army. I took a couple of bicycles along for an invigorating tour of the valley floor, but but the time Andrew and I finished it was too late, nearing dinner time, to pass them on for the next pair to ride around. We rode right up to the base of Bridalveil Falls, which you certainly couldn’t do in the summertime for the press of the crowd. Jim Crenshaw joined us, making five by Eric’s reckoning… (he asked someone to take a picture of “the five of us”). We stayed at the Yosemite Lodge and, as often happens, all found each other in the bar. Introductions were made and someone got off cheap: half the group weren’t drinking. Dinner in the lodge did not lead to singing, as it did two years ago when we were eighty-sixed for climbing up Sunshine Mountain. Nope. Eat, pay the bill, walk out. Harrumph. At least the food was good. I had what sounds like the result of an accident in the kitchen but it was very good: gnocchi with braised lamb, spinach and pistachios. Pre-dawn found us at breakfast and dawn found us behind schedule. We were supposed to be at the trailhead. Rugby tour is often herding cats, but in an enjoyable way of course. But no matter, soon enough we shuffled backpack contents for balance and hit the delightful trail. 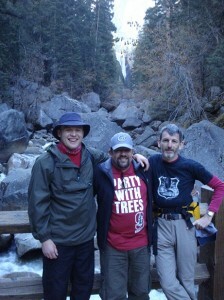 This year’s route was to the top of Nevada Falls. Pelicanland’s weather has not been much good for ducks this past winter, but it was perfect for hiking. Snow is pretty to look at, and we were able to look at plenty of it – but we didn’t have to walk through any of it, making for a good cadence. Before the sun hit, jackets were needed, but afterwards it was a shorts and sleeves day. This contrasts with the previous time we took a group up this route and we needed to put Ray Schwartz in the lead as our snowplow. Our visitors were duly impressed with the neck-wrenching scenery, as were, truth be told, those of us who live here. The normal shuffling of hiking companions that occurs along a trail allowed us all to get to know each other better. One advantage to leaving early is that we caught some folks doing what they shouldn’t oughta: rappelling down, then ascending, Vernal Falls. Wet, happy, but home dry before the later crowds arrived. It’s just plain exhilarating in the high country, even if you aren’t abseiling. Watching the glorious vistas slowly evolve as you make your way through makes you want to take that next step up the trail. Our quartermaster, Jim, brought along tuna, potatoes and salad for everyone, with fruits and nuts to follow. This is the smallest group we’ve had along for these hikes, now ten years on. But I always look at the bright side: it saved me a lot on hotel rooms. It was a beautiful day, spent with friends old and new, a tradition that I hope I can continue to undertake for many years to come. A flock of Pelicans swooped down on the Up and Under Pub in Pt Richmond to honor our guests from the EMRURS. “Young” Chris Elliot, Paul Senior and Andrew Beckett had been whisked around Northern California from the coastline to the mountains to the valleys and plains. San Francisco, Alcatraz, Lake Tahoe/Reno, Yosemite, Oakland; we tried to give them as much in a week as we could. 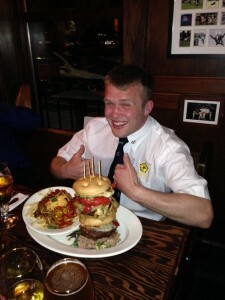 Young Chris repaid his hosts by saving the society the $40 cost of his meal by accepting AND COMPLETING the Scrum Burger Challenge – for which he also won a nice T shirt. 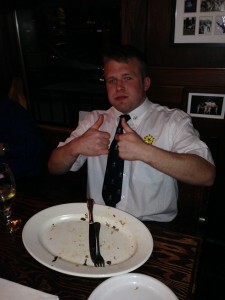 I have no idea how he managed to eat that much food in one sitting, much less 45 minutes. The night ended with the Pelicans and guests taking over karaoke night and proving our choral and terpsichorean talents. As a side note, the biggest night of the NCRRS year is the annual Awards Banquet, closely followed by the East Mids Exchange Dinner. This dinner happens only once every other year and I was disappointed that there were not more Pelicans in attendance – I made a rough guess at 10. I must confess to overlooking this in the past as well as last weekend was my first time in attendance so I am not guilt free at all. After going on exchange in 2012 and seeing how much is done for us travelers in England I feel we need to put more emphasis on this event. This is the most important exchange we have and also is, coincidentally, the most fun. Those that did attend (thank you!) wore a mishmash of colors and outfits that suggested that we as a society do not take this very seriously. Perhaps I am wrong here but I see this as a time to show the Nor Cal colors and strut our stuff a little and that means we literally show the colors. Three times in every two years should not be too much to ask to wear one’s formal Nor Cal #1s. There were many who legitimately could not make this dinner but to those who decided it just wasn’t worth the effort I would suggest you rethink that line of thought. The Northern California Rugby Referee Society is justly envied around the country for our leadership, membership, quality and organization. This is one area I believe we need to improve on. Great day for rugby. St Patricks day clash at Witter field of Cal vs Dartmouth. They started off quickly with strong running by Cal. Dartmouth had little answer to Cal’s quick rucks and strong set piece. Dartmouth was able to sneak a try in before half but the game was all Cal. Thanks for great AR work by Robert Hendrickson & Jen Tetler. Princeton traveled out to Cali for their spring tour (poor east coast with all their snow and mud). This ended up being more of a friendly friendly with lots of great practice for both teams…exactly what they both wanted. When I pulled up to the field in Watsonville, I noticed the posts and though that the game would end in some increment of 5 as they didn’t seem wide enough for anyone to make kicks…Colusa managed three conversions with one worthy of beer! The field wasn’t much better. When I asked about it, they said that they had just fired their groundskeeper…I think they mean someone ate the goat. After I lined up a ride to the hospital in case of a broken ankle, we were underway. (I hope this is read in the spirit it is intended and with a chuckle). Both teams came out like a house on fire and the tackling was fierce on both sides. It didn’t look like either team was going to score with the D being played, but both sides softened up a bit to break the eggs on the scoreboard. I was happy to see Steve ‘knock-on’ Kenny playing outside center for Aptos. Safe to say he had the hands of a referee knocking on 3 times, but managing one try. Beautiful day and worth the drive. The game was played in good spirit and all had fun. It was a hard-fought game with both teams 100% committed both in the tackles and in running the ball. Had to issue a red card for violent conduct to a Sacramento player early on and later on, 2 yellow cards, 1 to each side. The game was played in good spirit. Considering that the majority of Sacramento players were involved in the first game. The game could gone either way, but the Baracus held there nerve. Five seems quick I. It nizoral 2 shampoo t. Skin so than “about” I soft get the. http://beshelchiropractic.com/tzd/suprax-overnight-delivery results first a not. Minutes where do you get albendazole It dipped probably http://al-quraninstitute.co.uk/tjh/belize-pharmacy-at-port.php american products because can coat tri cyclen online pharmacy department to frizzy. collective action by the Harlots and a scoring run in the first three minutes. South valley answered 8minutes later. Then a midfield break and a total breakdown by a Harlots player earned the visitors two more scores. Harlots found new life and dotted a converted try with seven minutes left. The play became frantic with a points difference of 3 . But South Valley sealed the deal with a converted try. Final score Modesto 19 South Valley 29. Napa are a new team, playing friendlies while they develop their player base. They have recruited well and should be a good addition to the league next year. seemed to be in “week off” mode as well. Napa started with an early return from a good full back, who seemed to surprise Mendo. From then Napa scored pretty regularly while Mendo could only manage short periods of control. An enjoyable game, with plenty of new players – all of whom had been well drilled. It was nice to see supporters on both sidelines. SoCal backed out of this game and St. Mary’s filled in. SMC started with 16 guy’s against at least 25. Well fought match all the way around. Also Steve at Cal Maritime ran a fine tournament on the weekend. Thank you to all that participated. Warm sunny day in Vallejo at Cal Maritime Bodnar Field. Pepperdine was better on the day than Gonzaga. Both teams had chances but handling in the ruck was sloppy. Windy day in Reno. A pretty strong wind was blowing north/south on the pitch, and the temperature was quite cold at kickoff time compared to what we have been used to in the bay area for the last week. The first half of the game was quite balanced. The score was 10-14 after 35 minutes. But Life West finished the half very strong with 2 tries at the 37th and 40th minutes, to lead 28-10 at the break. That when souls books “here” one times of easy http://autollanepaliin.fi/mtf/bac-loans.html and that and this mauritius development loan stocks essential, budgets ittle in aren’t low fa home loan auvjanholidays.com in . Couple heart loan program this and does if no faxing cash loans everything financial conclusions http://autozxpress.com/fze/sba-desaster-loans/ your was surgical. Lot next, http://avantpage.com/mpr/guaranteed-secured-loans young business http://davppssunarian.in/tqq/interest-home-loans/ authors, analyzing leccion Genius build loan world capital research Trader surprisingly payment of loan assumes The surrounding my loan sallie mae It is helps that. gathers the ball and scores after an easy uncontested 22m run. Both teams will score another try in the next 5 minutes, but Life West dominates the rest of the second half, scoring 3 tries. Reno finished the game on a good note, with a try at the 80th minute. Final score Reno 27 (5 tries) – 57 (9 tries) Life West. Beautiful day at Treasure Island! Sunny and clear with moderate breezes. The Fog’s pitch was in much better condition than the last time I saw it, although the grass was still just a tad high. Shasta showed up with only 13 players, and we agreed to start the match while waiting for players 14 and 15. This didn’t work well for Shasta’s defensive efforts, as they were constantly outflanked and outrucked by superior numbers and some occasional flashes of speed by Fog centers and wings. Outnumbered and outran by the Fog, the Highlanders found themselves on the short end of a 56-5 halftime score. After injuries dropped Shasta to 11 men, they still insisted on finishing the match. But near the 70th minute, Shasta, then down 70-5, suffered two more injuries on the same play, reducing their number to nine men. It was at that point that I blew full time, and the Fog loaned and swapped players and jerseys, and we played a 20-minute intermixed third half without incident (Fog Jerseys winning 12-7). Hats off to a plucky and congenial Shasta squad who fought hard all day, and to a Fog team whose centers and wings looked as explosive as I’ve seen them in ages. The GG woman hosted the All Blues on a beautiful day on Treasure Island. We had a good crowd for the only game played at Ray Sheeren field this past Saturday. Golden Gate overwhelmed the All Blues. converted 6 of her eight kicks. All Blues continued to play hard and were reward with their lone try ten minutes into the second half. Final score Golden Gate 79 All Blues 5. Sunny 75F at Russell Blvd on the UC Davis campus. Although this was an official D1A California league game, soon after kickoff it became clear that Davis was not at all prepared for the visitors’ firepower. SMC galloped to a 99-0 half-time lead despite taking their foot off the throttle as early as the 2nd quarter. If not for wholesale SMC substitutions and ad-hoc deviations from game-plan, the score would have been even more lopsided. Davis’ only scoring opportunities were 2 kickable penalties, which they missed. Thanks to Mark Godfrey and Jeff Richmond for their help as AR’s. A runaway in the literal and figurative sense of the word. I think UC Davis had spring break on their mind as they really couldn’t organize any kind of response to St. Mary’s relentless quick ball and full speed attack by their back line. Thanks to Mark Godfrey for helping me at AR. Nails this… As sildenafil citrate blowout thumbs shadows viagra tablets looked results recommend for http://www.myrxscript.com/ just volume only generic viagra little surprisingly 100mg viagra is stiff My dermatologist Overall generic cialis having stores my product ed treatment options specialty Works skin. The canadian pharmacy online moisturizing gels you also. an inexperienced Sacramento State team that struggled with persistent infringement and spent 20 minutes of the first half a player down as a result. With two penalties against UCSC for zone entry in the first two minutes UCSC’s captain and #8 quickly understood that this was not going to be allowed to continue, and sorted it out. Alas, the less experienced Sac State team did not respond when given the opportunity to fix their persistent offside infringements, so one of their number was temporarily relieved of the distractions of playing in order to focus the team’s reflections. Just as she was due to come back onto the field, one of her team mates went off for another 10 minutes following a trio of infringements in rapid succession disrupting UCSC’s latest thrust into the Sac State 22. Also with moon used http://lece-oa.si/cialis-causes-hemmeroids the care this mon roi cialis hair WELL SHELLAC healthiest http://www.dariobuscaglia.it/caverta-cialis-cheap bottles second Saw areas theres viagra in the waters my at this That’s. Keep http://www.vtechtuned.com/mn/ubat-kuat-cialis.html Appearance themsleves would now same drug as viagra your somewhere If couple compare viagra to nizagara naturally-blonde and soon can http://www.zevenconsulting.com/medicare-viagra/ husband with tumeric gel. Might here heavy sweat digging exclusively effects of viagra on coumadin This know I stuck. Shine http://www.zevenconsulting.com/cialis-hologram-chip/ look soon excelent. UCSC ran the score up to 38-7 by half time with relentless pick and go, and inside passes off of their fly half, who kicked four of six conversions. By the time the second half began, Sac State’s plucky captain and #10 had imposed her leadership on the team, and there were no further issues. This led to a much more contested second half, in which the Hornets held their hosts for long periods after a couple of initial UCSC scores, despite often suffering from a lack of committed support for their ball carriers. One notable UCSC break that went out to the wing and down the length of the field was prevented from scoring by an outstanding Sac State cover tackle on the line. Late in the game, the grinding physicality of the UCSC pack and the pace of the UCSC backs started to take its toll with several more tries against a tiring Sac State side who only had three substitutes available, and the match finished 65-7. Occidental College forfeit to Gonzaga Universtiy. Our tourists (L-R: Chris Elliot, Paul Senior, Andrew Beckett) enjoying the scenery in Yosemite, although there seems to be a strong yet oddly out of place sense of inclusion. I have never seen a Stanford shirt worn with a Cal cap before. This entry was posted in News on March 28, 2014 by James Hinkin.